Increase Affiliates. Mobile storage operators can reap significant rewards from increasing the number of affiliates they have in the field. Affiliates generate a steady stream of new customers and revenue. This should be a priority goal for every operation. Market, Market, Market. 30 minutes a day is all it takes to enhance your marketing efforts. Setting 30 minutes aside each day to engage on social media, send emails, or draft video scripts can go a long way towards increasing brand awareness and recognition. Produce Videos. Videos get a lot of traction in today’s fast-paced, information-fluid environment. Short 30-second to 1-minute videos full of moving tips, storage tips, and industry related information will go a long way towards attracting new customers to your business. Integrate Technology. In particular, this means making your website and interfaces mobile friendly. More and more customers are reaching out to businesses using mobile platforms and if your business doesn’t have these in place over the coming year, you will be left behind. Increase Involvement in the Community. Volunteer at community events, donate products and services to area causes and be sure that your business is taking an active role in the health and welfare of the community. Customers who see you are engaged and active will admire and respect your business and will be delighted to hire you for their storage needs. Strengthen Training. Solid staff are the core of every successful business. Make sure your employees are at the top of their game when it comes to logistical planning, customer services, warehousing techniques, and storage technologies. Expand Your Market Area. Whether you are in a small community or a large city, there are always opportunities to expand your reach. To that end, identify target markets and take the necessary steps to expand your reach into these areas. Invest in the Future. Whether you need more warehouse space, or new containers, identify and commit to the most beneficial investments for your mobile storage operations. You should invest in the areas of your business that will generate the most positive long-term returns. Engage with Customers. Your customers are a wealth of information that you can tap into. They will tell you everything from suggestions on ways to improve your services to services they would like you to offer. Engaging with your customers will give you valuable insight into your operations from the customer’s point of view. This is information you can use to tailor your offerings to the community’s needs. Strengthen Partnerships. Not every business has the financial means required to expand into far-reaching territories. However, businesses that partner together can provide the same level of long-distance moving services and quality of companies including U-Haul, PODS, etc. Expanding your partnerships will allow you to increase the reach of your business while providing a considerable boost to your bottom line. 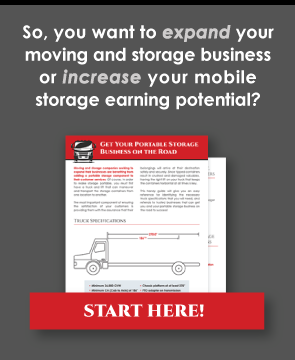 Of course, your mobile storage business may have other goals you need to set for the coming year. Now is the right time to sit down and identify them. Just remember that identifying goals is only the first step. As with any goal, be sure to chart out a course of action and create benchmarks for each goal. This is essential so that you can measure your progress and success at achieving your objectives.